TRIANGLE, VA -- Golf's expensive. Really going out on a limb for that one, huh? It's no secret these days that the monetary stakes in the golf industry are being raised in virtually every category -- for example, PGA Tour purses and appearance fees for the cream of the crop have dramatically increased in the last decade; new upscale golf courses are popping up in population rich areas, fueled by land developers and the need to attract lucrative buyers -- with prices to match; even new golf equipment sometimes separates the 'haves' from the 'have nots.' There's no equality to it -- it's a dog eat dog world out there. The 199 yard, par three 13th hole is anything but unlucky. Even on this rainy day, it's still a treat to look at. Along with the increased demand and limited supply, our basic economics lessons tell us prices rise accordingly. The old adage may say 'You get what you pay for,' but that's not always true in golf. Sometimes you pay a lot and don't receive a good value in kind. Caveat Emptor. Let the buyer beware. That's why it's nice to have a place like Forest Greens Golf Club, in Triangle, Virginia (32 miles south of Washington, D.C., near the Quantico Military Base). 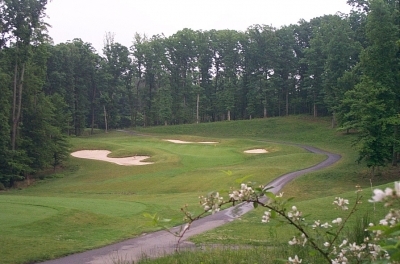 Forest Greens is owned and operated by the Prince William County Park Authority, and provides an excellent Clyde Johnston designed championship layout, complete with rolling hills, tree-lined fairways (no houses) and resort style service. It'll give you a golf date reminiscent of a fine resort at more reasonable daily fee prices. Peter Kim, Forest Greens' Head Golf Professional, says the nature of the course and its location are the club's strong suits. "I think we have a very fair course, but it's challenging because of the layout -- you're faced with all types of shots out there. And being right next to I-95, we're very accessible to much of the population of the DC area, and it's always a good thing when you won't have to drive too far to get to us." 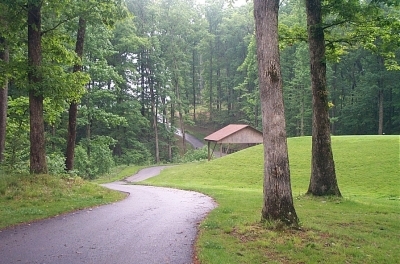 Yes, Forest Greens is a county owned golf course -- but most of the back nine is out in 'nature,' and there's even shelter from the rain and elements. Course architect Clyde Johnston is best known for his work in South Carolina, having designed or assisted in building several of the more prominent courses in and around Hilton Head Island and Myrtle Beach. He's clearly worked hard to incorporate Forest Greens' natural setting in the layout, and it seems to work very well. Forest Greens doesn't have the marshy wetlands that Johnston's seen a lot of down there in the Low Country, but at Forest Greens he's used Virginia's elevation changes and slopes to their best advantage. I will note -- that while the course's layout could compete with many of the upscale courses in the area, you won't find resort conditions. The bentgrass tees and greens are in fine shape, but the Bermuda fairways are in rough condition. That's been the knock on Forest Greens since it opened in 1996 -- and I can't help but think that when the course 'grows in' that it'll reach its full potential. In the meantime, one of Forest Greens' strongest suits is its player friendly layout. The greens are fairly large and not overly severe. There are few forced carries, and a number of greens will receive a run-up. If your tee ball stays in the fairway, you'll have a good chance to score well here. Kim says "if you do a good job in course management, you won't find the trouble," and I definitely agree. This is a course you'll want to play within your game. Architect Clyde Johnston elevates many of the tees at Forest Greens, making the course play shorter than its posted yardage. Most of the holes are tree-lined on at least one side, so it calls for careful club consideration from the tees. It also makes the course play longer than its yardage. The landing areas are somewhat generous, though on a few of the blind tee shots, you'll need to guard against hitting it through the fairway. That's not saying the course is unfair -- on the contrary. The somewhat blind tee shots are due to elevations changes -- not crazy twists and turns. 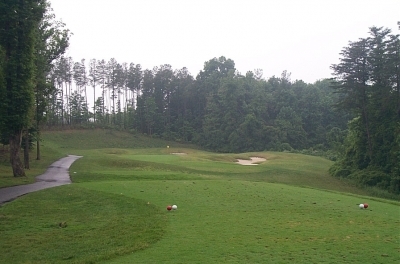 You won't hit one down the center only to find your ball's rolled into a bunker or tall grass. But some of the holes depend very much on placement -- it helps to play the course with someone who can advise club selection, because there's no yardage book available. Johnston starts you off with a fairly tame 383 yard par four, dogleg left. The tee shot's steeply downhill, with a bunker long and right to catch balls struck a tad too firmly. It's probably advisable to club down off the tee, but if you don't hit it far enough -- or leave it too far left, trees will block your view of the green. The 576 yard, par five 10th hole is considered Forest Greens' signature hole. Because of the elevation change, it's a wild ride all the way. Two is a nice short par four, 336 yards from the back tee. A short hole, but one where you'll still have room to hit driver. Slightly downhill, but a well bunkered green won't allow for run-up possibilities. No dreams of eagle putts here, folks -- unless you can hit it over 300 yards in the air and stop it quick. Five is a nice 525 yard par five, dogleg right. The fairway slopes from left to right, so if you can fade the ball, there's a good chance you can use the slope to add some extra distance. The second shot's slightly downhill and fairly wide open, inviting a shot to try and reach it in two. If you can keep it out of the woods on this hole, you'll have at least a reasonable birdie chance. Eight is another interesting par five, 535 yards, straight on and sloping up. Tee balls must carry some wetlands to reach a plateau fairway. From there you're still looking straight uphill, and again, local knowledge is helpful to give you an idea of how far to lay-up for your third shot. The green is large but two-tiered, so it's essential to choose the right club for your approach. Tough hole. The 12th hole is an interesting short par four. The same ridge that you'll trudge up on the eighth gives you a break on nine. The tee shot drops about 40 feet, making this 428 yard par four play much shorter. There's water on the tee shot long and right, and a bunker to the left, but a lot of room in between. Second shots are slightly uphill, and the green's protected by bunkers left and right. 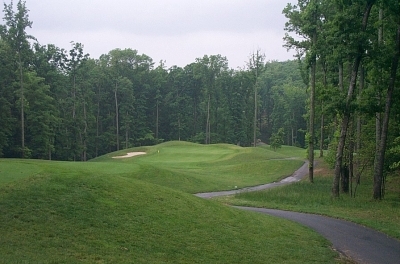 Ten is considered Forest Green's signature hole. It's a 576 yard steep dogleg left. Tee off over a mowed ravine, and if you're able to hit a nice draw, you might be able to cut the corner. The hole drops 80 feet in elevation from tee to green, so if you're long and know where to aim, it's possible to reach it in two. You won't be able to see the putting surface on your second ball, so you better have a good idea of where to place the shot. Twelve is an interesting short par four. Tee shots must avoid water on the left and a bunker long, but the challenge is on the second shot. Severely uphill, the green looks like it's on Mt. Olympus, and it's not likely that rolling the ball up there's going to work. It doesn't look like it from the fairway, but the green is huge and relatively flat, so if you knock it up on the plateau, you'll have a putt for birdie. 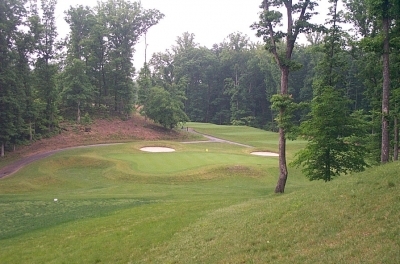 Forest Greens' Bermuda surfaces are unusual for a course is the DC area, but sure grow lush in the summertime. 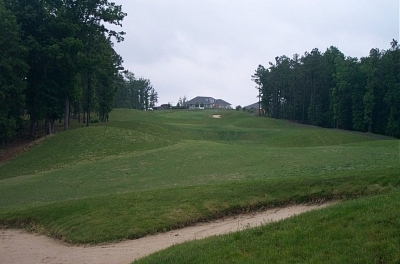 Thirteen is a nice 199 yard par three that plays down a steep slope to a multi-tiered green. Pay close attention to the flag location and wind direction for club selection -- the green is quite deep, but not very wide. Sixteen may qualify as the most picturesque hole at Forest Greens, a nice short par three that plays downhill to a well-bunkered green. Choose enough club to avoid the massive bunker front and left, but once again, the putting surface is large and receptive to reasonably struck tee balls. Eighteen is one of the toughest par fives I've seen in a while. 552 yards from the back tees, it's uphill the whole way. Try and hit your tee shot past the two fairway bunkers on the right, but the real challenge starts on the second shot. You'll see the pin high up on the hill, and several plateaus in the fairway from which to try and aim. It's going to take three good shots to reach this putting surface in regulation. 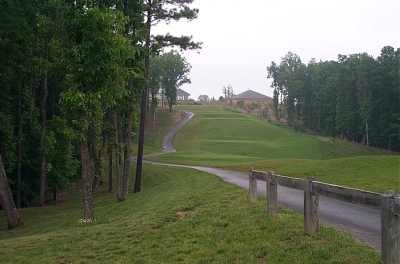 Forest Greens' par five finishing hole is straight uphill, and one of the tougher closing tests in the area. When you're done, you can't help but feel satisfaction at navigating this thoughtful course. It's a nice, publicly owned layout that won't break your bank account, is easy to get to, and provides good play without a lot of frills. You'll get your money's worth. All in all, quite a square deal.